But rather than stand united, the station-cities of the Metro are locked in a struggle for the ultimate power, a doomsday device from the military vaults of D6. A civil war is stirring that could wipe humanity from the face of the earth forever. 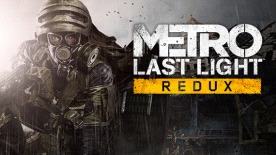 As Artyom, burdened by guilt but driven by hope, you hold the key to our survival – the last light in our darkest hour… Product Overview: Metro: Last Light Redux is the definitive version of the critically acclaimed ‘Metro: Last Light’, rebuilt in the latest and greatest iteration of the 4A Engine for Next Gen. Newcomers will get the chance to experience one of the finest story-driven shooters of all time; an epic adventure combining gripping survival horror, exploration and tactical combat and stealth.